Have y’all ever gotten a cherry limeade from Sonic? Are they not one of the most delicious things you’ve ever drank? Drunk? Slurped? Sipped on? 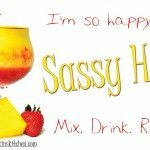 If you’ve made my Pineapple Upside Down Cake Daiquiri then you know that I am not the biggest fan of grenadine, but I like to pretend that the sugary syrup is not in Sonic’s limeades. I will happily slurp away at one with no qualms about it…well, I used to have no problems with it. Once I hopped on the healthy train, I discovered diet cherry limeades and I was thrilled! 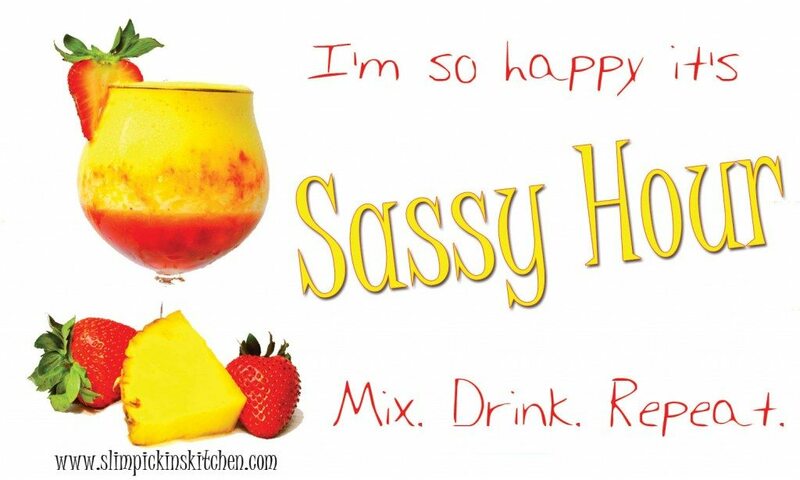 Same great taste with waaaaay less calories and no sticky, icky grenadine. But THEN I discovered the *strawberry* limeades which were even more delicious than their cherry counterparts, and my world was rocked to the core. They have chunks of fresh strawberries speckled throughout them which are easily sucked up through the bright red Sonic straws and dispersed into my awaiting mouth ….mmmmmmm……..
One day an idea came to me, and I thought I was totally awesome and smarter than every other foodie in Charleston when I asked my hubs to bring me back a diet strawberry limeade. I was so excited (I get ridiculously thrilled when it comes to all things food) and my eyes twinkled like fireflies in the night sky when I saw him walk through the door with a cup the size of our 18lb cat in his hands. That cup was all mine and it was “diet” so I had not a thing to worry about! First off husband, get a clue! He knows I’m an overdramatic pompous priss, and he could have easily reworded that phrase to say something along the lines of, “I’m sorry, angel cake of my morning sky, this isn’t completely diet, but it is made with diet sprite”…or…”There is a wee bit of sugar, but it is still way less calories than the regular version”…or even…”Well, there is a little bit of sugar in here, but not enough to make too much of a difference”….instead of coming right out and saying the dreaded words and watching my heart splatter all over the floor, resembling the macerated strawberries at the bottom of my oversized cup. Secondly, how could I have been such a dumb dumb? Of course mascerated strawberries had sugar in them! And, considering they were from a fast food restaurant, they probably had 757 cups of sugar per pint of strawberries. So, alas, my life was ruined and my dreams of strawberry fields forever were mashed into a saucy, bloody pulp. 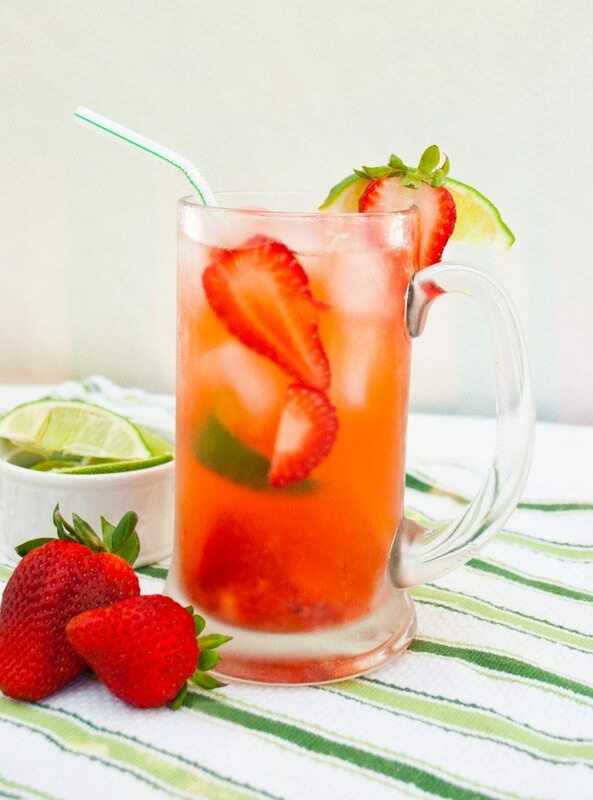 After lying under the covers for weeks bawling my brains out while listening to Mariah Carey & Boys II Men’s “One Sweet Day” and denying the hubs all forms of physical contact, I slowly slithered out of bed and got back into the kitchen determined to make myself a strawberry limeade that NO ONE could take away from me again. Add 1 cup strawberries, the liquid stevia drops, and the water to a small saucepan and place over medium-high heat, bringing to a boil. Lower heat to medium and let simmer for 10 mins. While syrup is simmering, stir together the remaining strawberries and the stevia in the raw, refrigerating until ready to use. Remove the syrup from heat and, using a wire sieve, strain the liquid into a small dish or bowl. Discard pulp. Fill a large glass with ice, add 1 ½ oz. 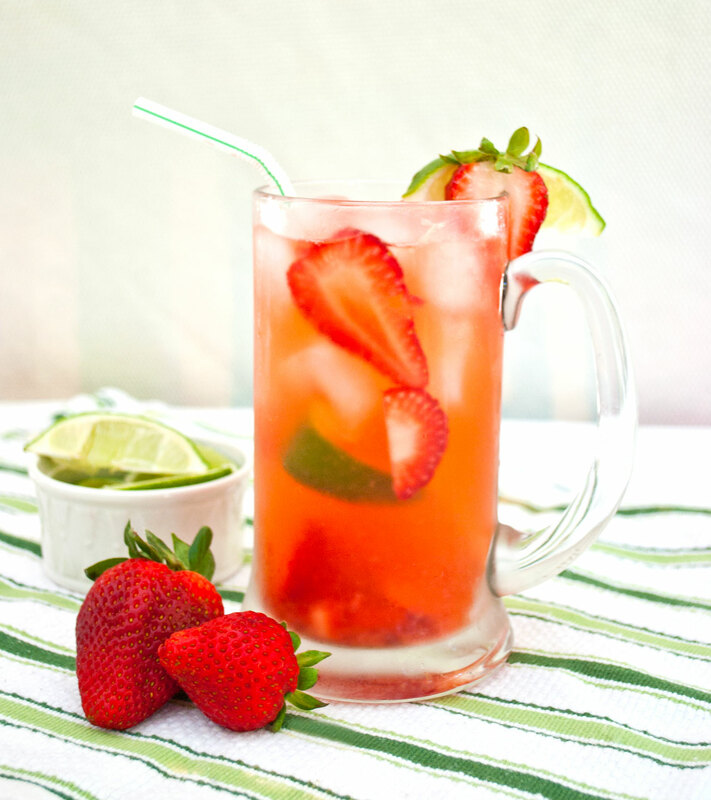 of vodka, 2 tbsp of strawberry syrup, 1/4 of the sweetened strawberries, the juice of one lime wedge, and top off with the sprite. Stir to combine and garnish with a lime wedge. Do you get as devastated as I do when it comes to food mishaps? What’s your favorite Boys II Men song? Yup, summer is my fitness downfall because I only wanna drink sugary stuff. Thank goodness you have a skinny version! YESSS! I know, right?!? I’m the same way, especially since June is both mine and the hubs birthday month! Be careful with these though…you can’t drink just one! Amber – OMG. I LOVE Sonic – mostly for their drinks, not so much their food. And since I’m on Weight Watchers and hoping to never exactly go back to the old me that ate whatever I wanted in “moderation” (read: lots of little bites that added up to the whole thing over the course of the day), you are a life saver right now. 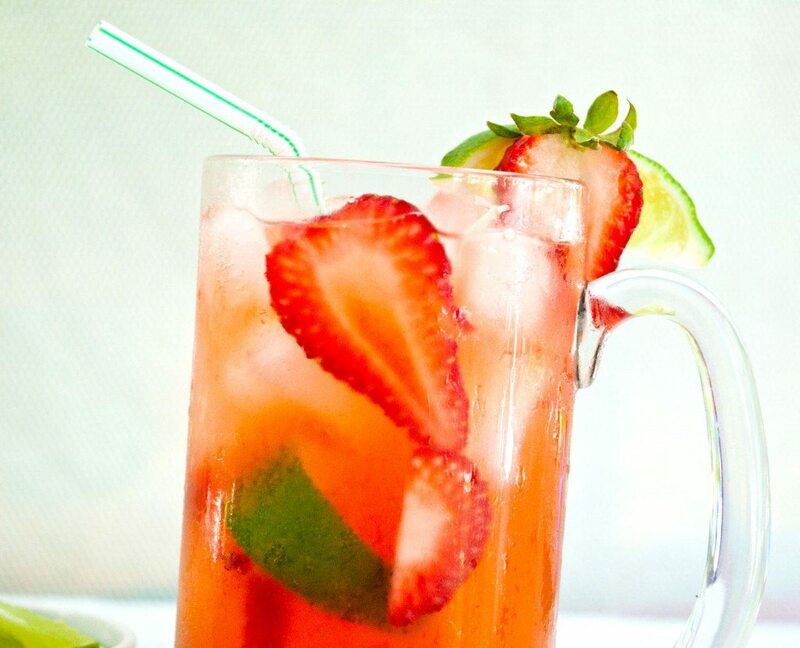 YES, strawberry limeade over cherry any day. YES, Boyz II Men rocks my world (no favorite song…for a while we had a Gen X radio station here in St. Louis that played Motown Philly all the time. Loved it). YES, food mishaps devastate me. Truly, though, I’m a bit of a drama queen. Any mishap can devastate me. But a hungry devastated me is a disaster for everyone! Thanks for the recipe. I know what I’ll be sipping/slurping on the 4th! 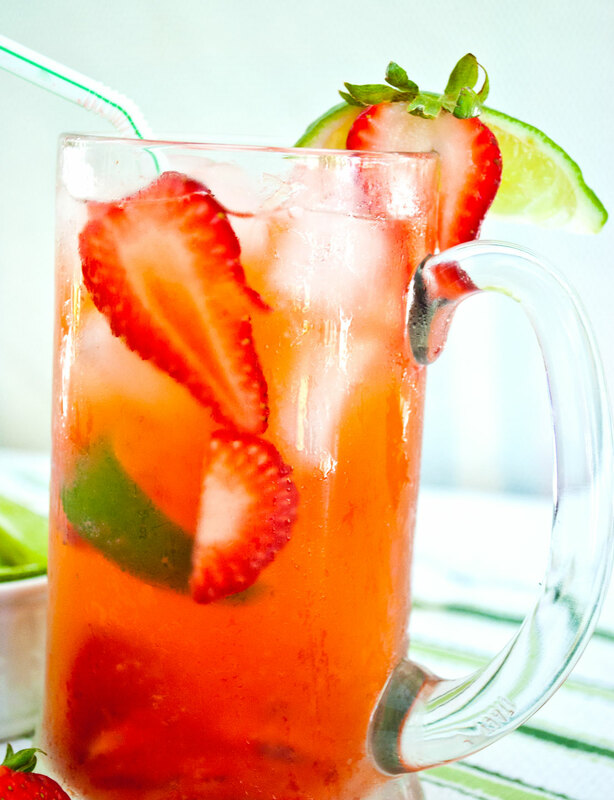 Yay for not only a diet strawberry limeade, but one with vodka!